Iron doors are becoming tremendously popular. They have been around a while, but in the past their purpose was strictly to provide safety, now iron doors are getting used as an entity to upgrade any location’s beauty. People are opting for iron gates because they beautify the surroundings and add value to the property. Iron doors come in varying designs and patterns, but if you are someone who is not pleased with the masses, then having a customized iron door will be your cup of tea. You can get customized iron doors where your specifications and requirements will be given supreme importance. Iron doors are also great when it comes to the durability factor. With a bit of maintenance, they will stay durable and won’t require frequent repairs. When painted with waterproof paints, iron gates are not subjugated to rust and other harsh conditions. A few waterproof coats will make them rust-free. They are also very robust which means they won’t break or become misshapen for any reason. If you are planning to replace your wooden doors with trendy iron gates, then StrictlyDoors are the perfect option for you. The company specializes in manufacturing Iron Stairs & Spirals in Las Vegas and also provides iron gates in Las Vegas, solar screens, ornamental iron fences, iron courtyards, patio covers, pool fencing, screen doors, and lots more. StrictlyDoors provides only quality products. Courtyard entry gates are the most vital part of your home. For maintaining safety and blocking the entry of unauthorized persons, courtyard entry gates are vital. Courtyard entry gates also increase the face value of your home, as this is the first thing outsiders see before entering the home. A courtyard gate is not just for the sake of protection, it also plays a vital role in enhancing the look of the house. Courtyard entry gates have been used for decades, but in the past, it was a matter of only rich people who used them. Now, with changing times and the affordability of courtyard gates, they can be purchased by anyone. Even for smaller homes, people are installing courtyard entry gates. A courtyard entry gates enhances the look of the house, but before purchasing, you should also check its materials. When it comes to the material, most people prefer iron courtyard gates over any other gates as the protection iron gates provide is unbeatable. Iron courtyard gates are tough to break or mold so one can easily rely on them to keep the safety of the house intact. If you are looking for quality iron courtyard gates, Strictly Doors and Gates is the right place for you. This company deals with only wrought iron products. 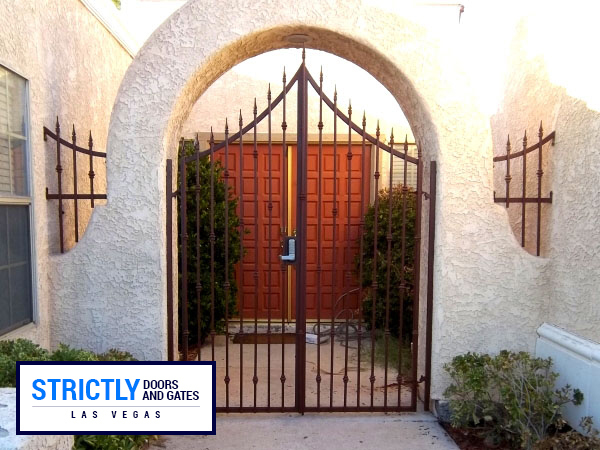 They manufacture quality iron courtyardentry gates in Las Vegas, and they also sell other high-quality wrought iron products such as fences, railings, stairs, doors, patio covers, and lots more. 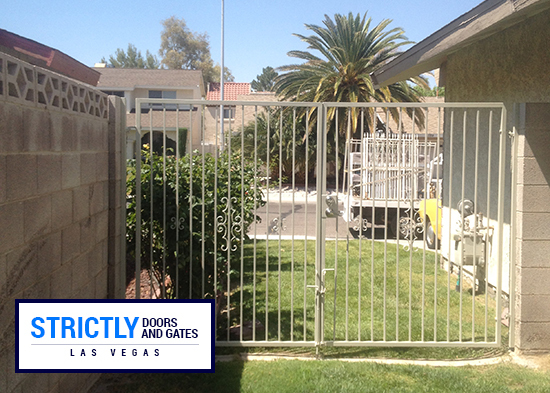 They are the most sought after company in Las Vegas over all other Gate Companies Las Vegas.